It's really rare to read a book that captures you and truly makes you stop and think. My Heart: Every Beat Surrendered to Our Unchanging God did just that for me. 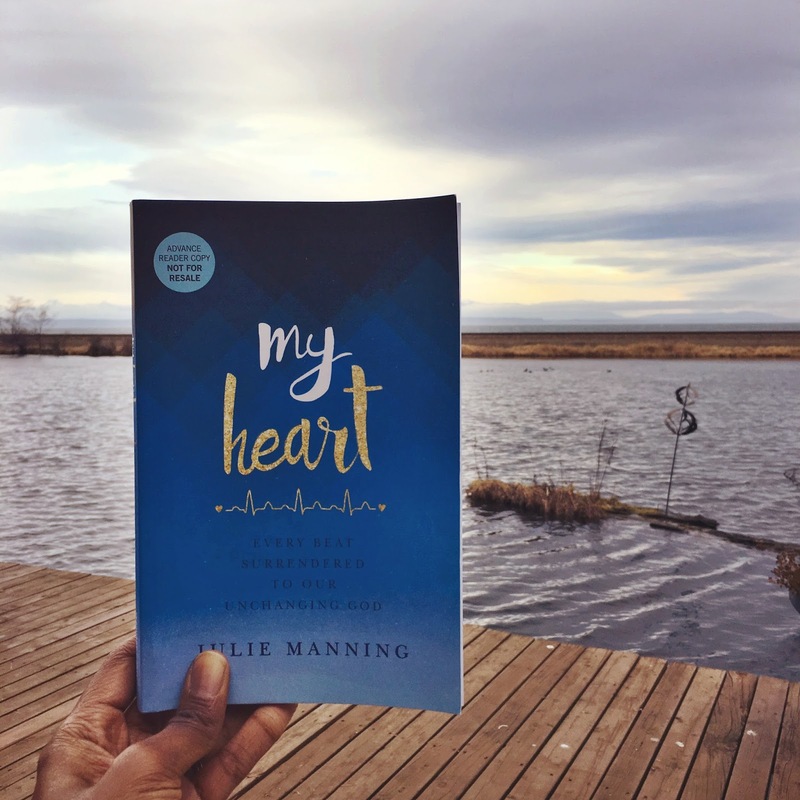 Julie Manning was a young and capable mom, a marathon runner, nurse, and an otherwise normal thirty-something when she found out that her heart was in failure. The news was a complete shock, and like any news of its kind, it completely rocked her world. Julie thus began a long journey toward healing- not just physically, but emotionally and spiritually, as the Lord began to show her that in all things Jesus truly is better and enough. In every season and at all times, Jesus is good and kind to us. Julie shares with you every part of her story- the diagnosis, her response to it and how that affected her marriage and family, and how God has sustained her since and what He has taught her in the midst of the deepest and darkest valleys. Her writing style is honest and kind, as she speaks to you as though she is your friend and you are someone that she greatly wants to encourage and lift up, wherever you find yourself. We have a choice. We have a decision to make. Remain or hope. Remain in discouragement. Remain in our sorrows. Remain in the sting of the pain. Remain in a state of belief that the lies the enemy feeds us are somehow true. OR hope in our Savior. Yes, I am imploring each one of us not merely to spend time contemplating hope or dialoging about what it might look like to actually hope. Rather, just do it. Just HOPE in Jesus. Hope in His saving grace. Hope in the blood of the Lamb. Hope in the One who has a place for us where the enemy may no longer dwell around us. Hope in the One whose Spirit can cover your body in goose bumps when the Holy Spirit shows up in your life. Hope in the One who does not need our perfect performance but whose performance on the cross was the perfect, finishing work. Hope in the Word of God that is sharper than a double-edged sword and does not go out and return void. Make the mental decision to hope until your emotions can catch up with your mind. As I read this book, I found myself deeply moved and questioning my own motives and lifestyle- what am I living for? What do I allow to steal my attention each day that won't matter ten years from now or even ten days from now? Am I sharing the story of what God has done in my life? Am I giving Him glory with my words and my actions? Am I placing my hope in the possibility that my less than favorable circumstances might change or in the unchanging character of my almighty God? These are the things we need to grab ahold of, and we need to allow them to shake us so that we are encouraged to live with purpose and love for that which is true, noble, excellent, and praiseworthy. Only then can we allow ourselves to live with surrendered hearts as we rest in the grace of our unchanging God.